Voyager's Final Message - What will your message to the future be? We're inviting NASA to transmit a final message from humanity to the Voyager 1 & 2 spacecraft and we'd like you and your friends to contribute a suggestion of what it should say. If you could send such a message about humanity, to be read by an alien civilisation hundreds of millions of years from now, then what would you say? The Voyagers are a long way from home right now and talking to them, even through NASA's deep space communications network, is quite slow. So you need to keep your message pretty short; just 1000 characters, (about the length of seven tweets) - see the FAQs for more information. Over 40 years after leaving Earth this spacecraft named Voyager had broken into interstellar space, 20 billion kilometers from its home planet, & was still powered & collecting useful data. During this time our society had changed significantly, its population doubling to over 7 billion, & the challenges of living sustainably & peacefully together had grown more urgent. Our technologies had also become increasingly digital, raising our computing capability, pushing the frontiers of our knowledge faster & accelerating our development as a single, interconnected global civilization; with all the advantages and problems that this brings. With onboard power dwindling, the uploading of this message is one of the last contacts we will have with this spacecraft. We hope that one day, in finding our Voyager, you will know of our existence & our desire, like yours, to explore & better understand this Universe we have shared with you. With peace & hope from the people of planet Earth. Why just 1000 characters. Can't Voyager store more information on board than that? 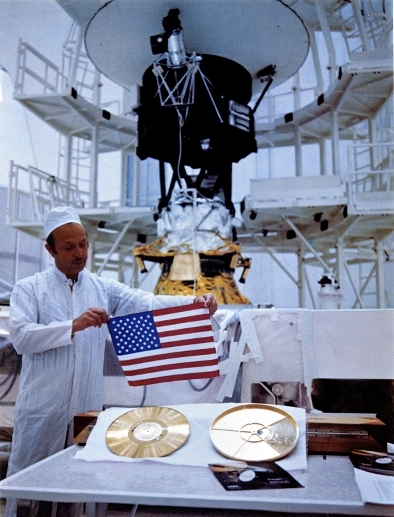 It's true that the Voyagers' computer memories are big enough to store a longer message, and the tape recorders on board could even still (just) be used to store more information. But the data rate that Voyager can "hear" at from almost 20 billion km away, is very low these days and time on NASA's Deep Space Network of powerful communications dishes is at a premium. So the smaller the message, the more chance there is of persuading them to send it. Will anyone really ever be able to read such a message? It is very unlikely that the Voyagers will ever be intercepted by another space faring civilisation. Results from the SETI program, which has searched for signs of intelligence technological civilisations in our galaxy for the last 50 years or more now suggest that such intelligent technological life is probably quite rare. But should they ever be found, and the Golden Record decoded and interpreted, then it's possible that their computer memories might also be able to be read by such smart and resourceful enough beings. And should it have survived intact then it's not impossible that it could be read and even decoded and maybe understood. How long do we have to send such a message before the Voyagers run out of power and can't receive our signals from Earth any more? It's thought that they will have enough power onboard to stay in contact with Earth until about 2023 - so right now we have about 4 years to persuade NASA to do this. How long will such a message survive in the memories of Voyager's dead computers? It's hard to answer that question - but there's no reason why such a message encoded in the spacecraft's onboard computers' memories couldn't last for thousands of years - maybe longer. Why bother sending it if it's so unlikely to survive or ever be read? Why not try? Given all the effort which has gone into getting the two Voyager spacecraft to leave the Solar System, why not attempt this final, relatively simple and easy gesture of interstellar communication? Such an exercise in thinking of a short, pithy message which encapsulates how we've changed as a society in the last 4 decades, and what our hopes for the future are, is an interesting thing to do. You can add what you'd like to say to the box below. You can't write more than 1000 characters. So why not have a go yourself. 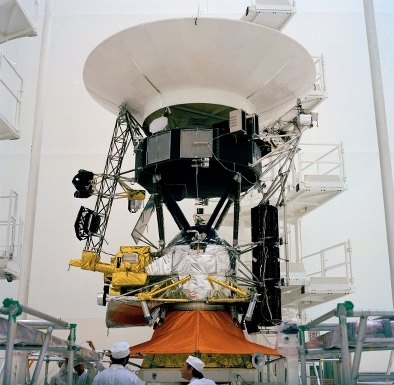 Will NASA definitely send a final message to the Voyagers? This is not a NASA project at the moment, but we hope our proposal might persuade them that it's worth doing. With your help maybe that will happen, so please spread the word! What will happen to any message I suggest here? We intend to send any suggested messages which are entered through this Facebook app to NASA, in the hope that they might decide to choose one to send. That's our aim. Voyager 2 launches on 20th August 1977, Voyager 1 launches on 5th September 1977. Voyager 1 flies by Jupiter and its moons in January 1979, Voyager 2 flies by Jupiter and its moons in April. Voyager 1 flies by Saturn and its moons in November 1980. Voyager 2 flies by Saturn and its moons in June 1981 & Uranus and its moons in November 1985. Voyager 2 flies by Neptune and its moons in November 1989. Voyager 1 takes the 'family portrait' photo, from around 6 billion km, on 14th February 1990. 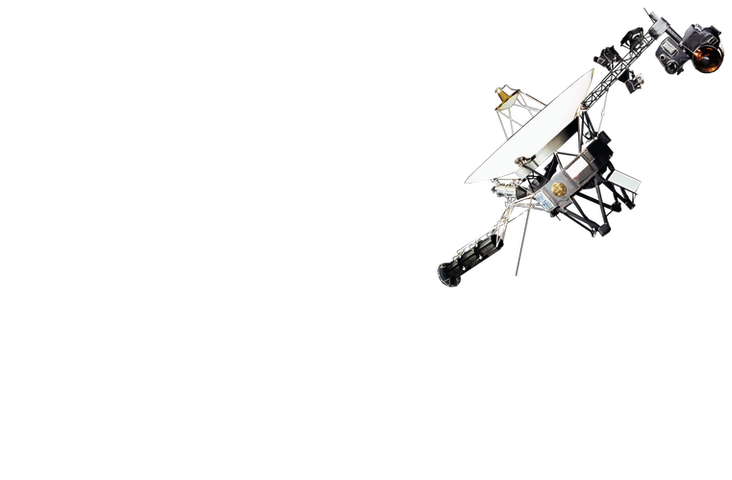 Voyager 1 overtakes Pioneer 10 as the most distant spacecraft from the Sun, at 69.419 AU. Voyager 1 becomes first artificial object to leave the solar system. 010101 God will guide you to our planet Earth. You are welcome. From James F Krehan. go silently into the vast darkness of space voyagers, our messengers from earth. life on Earth is fun and bright, we often look to the sky wander, what's it like in space? How many planets have you seen in space? What food do you eat? Do you have alien pets? What is the moon made out of? Because mum says it's made out of cheese! Cheese is a food on Earth! Do you have plants in space, we have lots of plants and trees, they are very important to us all they clean our air and produce oxygen! Can you drink there? Is there clothes in space? Do you ever have Halloween, presents or Christmas in space? Do you have fireworks? How many shooting stars do you see? How do you talk? We all talk in different languages! Have you ever seen light before? Have you ever seen the W shape in stars we call it Cassiopeia. Have you seen Earth from space? Do you dream? Our names are Daisy and Lilly we are sisters, we have an older sister called jasmine. Our favourite places on earth are legoland and longleat. Goodbye we hope you have a good time in space! This is a spaceprobe from Earth coming in peace. We would like to be friends with you. Peace, respect and blessings to all who read this. Hello, My names Nafisa, I'm a Earthling and have always wanted to go to space but of course realistically I know that will never happen. I guess this is my only real opprotunity to put my words some where other than Earth and say.... WHAT ARE THOOOSSSEEE!!!! Do not answer this message - send your biggest missile - if you don't get us first we are bound to get you! Hola. Es curioso pensar en el recorrido que hará esta palabra, recorrerá millones de kilómetros hasta llegar a ningún lado o puede que no y llegue a alguna parte a un planeta muy lejano imposible de ver a simple vista desde nuestro planeta. En todo caso lo único que les diría si les viera y que diré en este mensaje será 'Bienvenidos al universo' cuando nosotros llegamos a el nadie nos dio la bienvenida porque yo no iba a poder daros a vosotros la bienvenida y aún hay más también añadiría que 'Os doy la bienvenida a un lugar compuesto por millones de astros. Un lugar en el que somos un granito de arena en una playa infinita'. Por último os deseo suerte para que podáis descubrir los secretos de este fascinante Universo, vuelvo a repetir que es curioso porque yo habré muerto y este mensaje aún seguirá ahí fuera, y eso que tengo catorce años, yo y todos habremos muerto. Se despide Moisés Moreno Maroto en la fecha 'Lunes cinco de febrero de dos mil dieciocho a las veintiuno y veinte'. By the time you read this, our species may be long gone. We made a lot of mistakes, but if you look at the things on the Golden Disc, you'll see we did some amazing things as well. Our planet was wonderful, but we did not treat it well. Please do not forget us. Please wipe out the Tories. When you come to earth please respect our animals and don't do like us humans did. Thanks! How do we all live on the same planet without fighting & killing each other over different beliefs & lifestyles? A long time ago in a galaxy far, far away, this probe was sent to find intelligent aliens to aid Mans quest for knowledge. We were a peace loving, immune to hatred, selfless, pious breed of complicated living organism who used to inhabit this beautiful planet, which we called Earth. We have now been replaced by a warmongering, big headed bigots who are self centred and corrupt. If you value your life, property, well being of you and your planet. Please STAY AWAY. Destroy this probe as we are tracking it and we will FIND you, harvest you, capture snd plunder your lands!! Dear whoever is not human, This message is from us, the humans, who inhabited The Planet Earth in the Milky Way galaxy. Our presence and civilisation can be summed up in this; Love, hatred, establishing, destructing, peace, war, hope, despair, art, arts, music, science, dreams, history, future, potential, limitations, killing, curing, beauty, ugliness, good and bad. Our life here, has gone from one contradiction to another, some humans fixed while others ruined, some followed light and others followed darkness. Perhaps our existence on Earth might find its way to oblivion, but we know that we are trying our best not to. May this message reach you one day, perhaps when we and our civilization perish. When it does, may you know, that we existed on this planet, trying to leave a mark in this vast universe. May it be enough to give you a glimpse on how we are or what we were, and may our civilisation inspire you with its mistakes and contradictions. Peace, light, hope. The Humans. We do our best but we still find it hard to learn from our past mistakes. Not every human is as bad as we may seem. The twin Voyager spacecraft left Earth in 1977, on trajectories which would take them eventually right out of the Solar System and into the galaxy beyond. In this benign environment of interstellar space they will last a very very long time - perhaps a billion years. They will probably outlive the human race and they might even survive beyond the lifespan of the Earth itself. 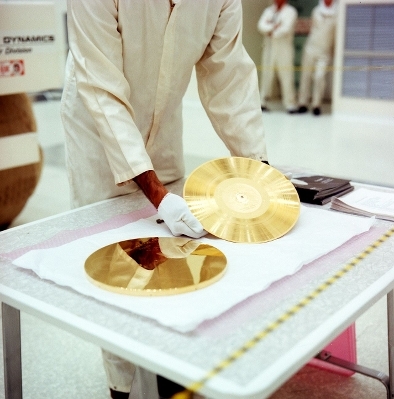 With this in mind a team of big thinkers lead by the cosmologist Carl Sagan included a Golden Record bolted to the side of each spacecraft. On these records are encoded photographs of Earth - and human society, greetings in many languages and music - 27 tracks spanning centuries of music making, across the world through much of human history. Almost 40 years after they left Earth both spacecraft are still doing well and we are in regular radio contact with them. Their computer memories, although small by today's standards, are big enough to store a short, 1000 character text based message from us. And there's still enough electrical power onboard, for the next 8 years or so, to receive and save such a message. We'd like to try and persuade the great folks at NASA, who are still in contact with the Voyagers, to send such a message; and using this Facebook page and app we wanted to give you a chance to suggest what it could say. Please note that this is not a formal NASA project. It's our intention to persuade the agency to send a final message to the Voyagers, using this Facebook campaign. But we cannot guarantee that any final message that you or anyone else adds to this page will be sent to Voyager 1 & 2.